Astronomers using NASA's Spitzer Space Telescope have given the world a spectacular new picture of a star-forming region called the "Christmas Tree Cluster," complete with first-ever views of a group of newborn stars still linked to their siblings. Spitzer's cameras are very sensitive to the infrared (heat), allowing astronomers to see through the obscuring gas and dust of the star-forming cloud that swaddles infant stars. 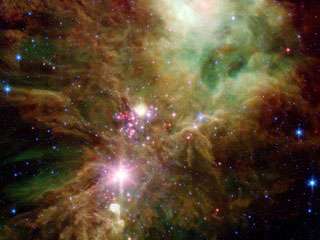 The Christmas Tree Cluster, also known as NGC 2264, is a well-studied region in the Monoceros (the Unicorn) constellation. The Christmas Tree Cluster was so named because it looks like a tree in visible light. The nebula is roughly 2,500 light-years away. That is, the nebula emitted the light in the new Spitzer image 2,500 years ago. For astronomers studying the development of very young stars -- stars less than a few million years old -- "This region has it all," said University of Arizona astronomer Erick T. Young. "We see the dramatic-looking emission of cold gas -- clouds that look like thunderheads. We see when the massive molecular cloud breaks up and begins to condense into clumps of stars," Young said. "And, for the first time, because of Spitzer's sensitivity, we can see individual stars roughly the size of our sun tightly packed within those clumps." The cluster of stars is so tightly packed that they must be less than 100,000 years old, he added. Astronomers are calling this compact collection of bright protostars within the Christmas Tree Cluster the "Snowflake Cluster" because of how they are spaced. The newborn stars are patterned like a single feathery crystal of snow, or geometrically spaced like spokes in a wheel. The Spitzer observations show that just as theory predicts, the density and temperature of the initial star-forming cloud dictates the spacing between the protostars. Young is deputy principal investigator for Spitzer's Multiband Imaging Photometer (MIPS), a UA-built camera that took the longest wavelengths of infrared light used in Christmas Tree Cluster mosaic. Astronomers combined light from MIPS and Spitzer's Infrared Array Camera (IRAC), developed by the Smithsonian Astrophysical Observatory, in constructing in the picture.